Julie London is the exception to the old maxim that beauty is only skin-deep. Equally matched with her statuesque grace is her warm sultry voice. In her teenage years she received some singing engagements in her home state of California, but it was Hollywood that was attracted by her beauty. She was cast in several low-budget films, usually in secondary roles. The movies, it appeared, would be her stepping stone to fame along with her marriage at the age of 19 in 1945 to radio actor Jack Webb, many years her senior. Jack Webb was ambitious and eager to advance both their careers and certainly achieved success for himself with the well remembered TV series Dragnet and the later Pete Kelly's Blues in which he both starred and directed. Meanwhile Julie's career had improved only slightly - she at least appeared in films with stars like Edward G. Robinson and Van Heflin. The marriage to Jack Webb ended in 1953, but Julie was then on the brink of a new career. 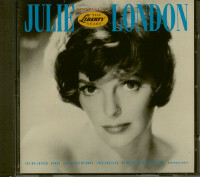 Under the guidance of composer, pianist and vocal coach Bobby Troup, whom Julie married in 1957, her artistry as a singer was developed. Bobby Troup, (author of the Nat King Cole hit Get Your Kicks on Route 66 as well as one of the great novelty standards Daddy - among the titles in this showcase) recognised the appeal of Julie's husky vocal quality. He launched her new career in 1955 with the simple, intimate accompaniment of Barney Kessel's guitar and Ray Leatherwood's bass in what has become the definitive version of Cry Me A River. And with her emergence as a singing star, Julie's acting career blossomed anew - both in movies and on television where, among other productions, she appeared in the long-running Emergency series. In spite of the rock and roll boom, the 1950's and 60's saw some of the finest quality recordings by the all-time great stars like Frank Sinatra, Ella Fitzgerald, Peggy Lee, Nat King Cole and Julie London. It was the album age - the proliferation of the LP, and Julie was very much an LP artist. Her output of some two albums a year gave us a memorable selection of extremely good and varied fare. Julie is her Name, Sophisticated Lady, Your Number Please, Julie - At Home are all highly prized by collectors. 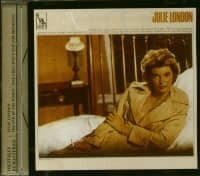 On this release we present twenty of the most popular tracks from the versatile and beautiful Julie London. Customer evaluation for "The Best Of Julie London - Liberty Years (CD)"